February 2016 Cancer Horoscope points to the dominance of career and personal ambitions over family and home affairs. Your family members fully understand your professional goals and take pride in extending wholehearted support for your efforts. Career progress is further advanced by humanitarian activities and social contacts for the Cancer zodiac sign. Planetary power is located in the Western half for the Cancerians in 2016 February. Hence social grace and adaptability will be important during the month. You should be cautious in your actions during the period of eclipse. Progress in career takes place at a reduced speed during the month for the crabs. Professional environment will be stress free. Unemployed will be able to get into very good jobs after 19th and business ventures will prosper in February 2016. The 2016 February astrology forecasts predict that the financial situation will be fabulous during the month after 19th. Your financial acumen will be powerful and investments in technology and health care sectors will bring in sound profits. People under the Cancer birthday will be in for financial dividends from unexpected sources that will accrue after the second week of the month. Overseas opportunities for financial income are probable. Old loans will be cleared by your surplus money. Credit facilities will be available to finance new ventures. Wealth can be expanded by assisting others to become richer. In turn they will assist you in becoming wealthier. The February 2016 monthly predictions for Cancer suggest that singles will be able to discover love in the professional circle, but the relationships will be more for fun. Plenty of possibilities will present themselves after 19th. Current relationships may face turbulence which will be temporary and blow over. You should reassess the status of your relationships and take necessary steps to harmonize the partnership. All decisions regarding the relationships and pregnancy should be taken after due consideration. Interference from some senior members of family in your love affairs may cause you frequent irritations in February 2016. There is a conflict between career and relationship requirements. Social interactions will show a downward trend. 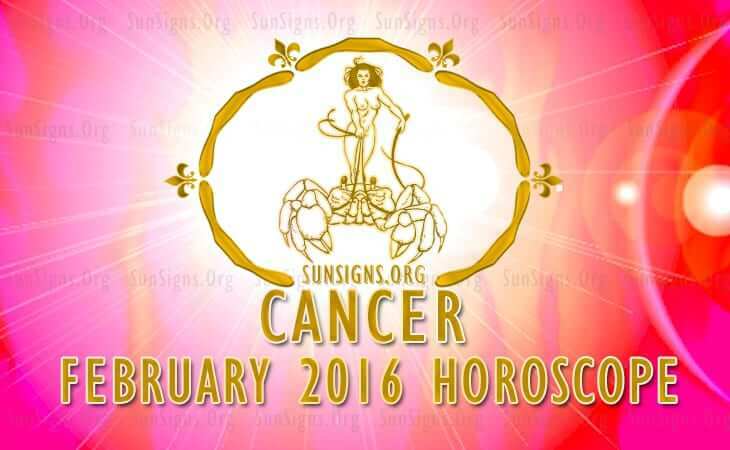 There will be a marked improvement in health for the Cancerians during February 2016. It can be enhanced further by exercise and alternative medicine. To conclude, the Cancer 2016 February horoscope foretells of a month of charitable activities and complicated relationships.